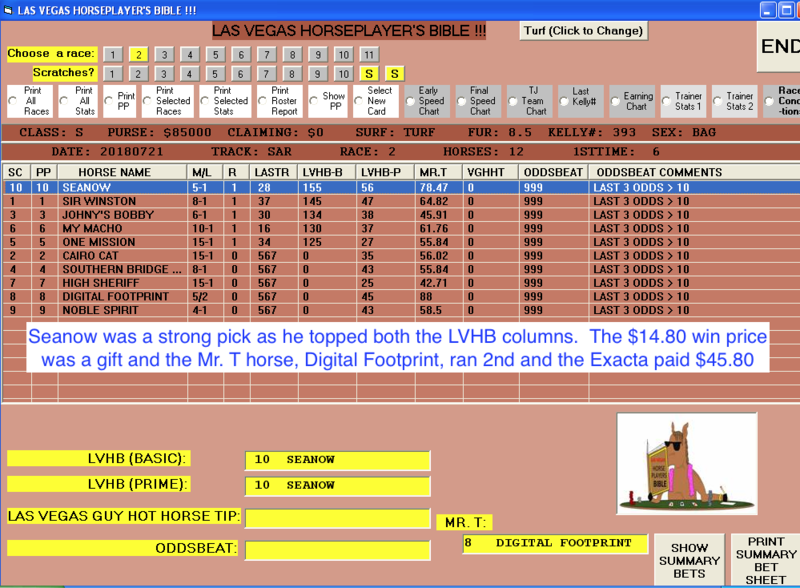 The Las Vegas Horseplayers’ Bible has been one of the best selling handicapping books of all times. 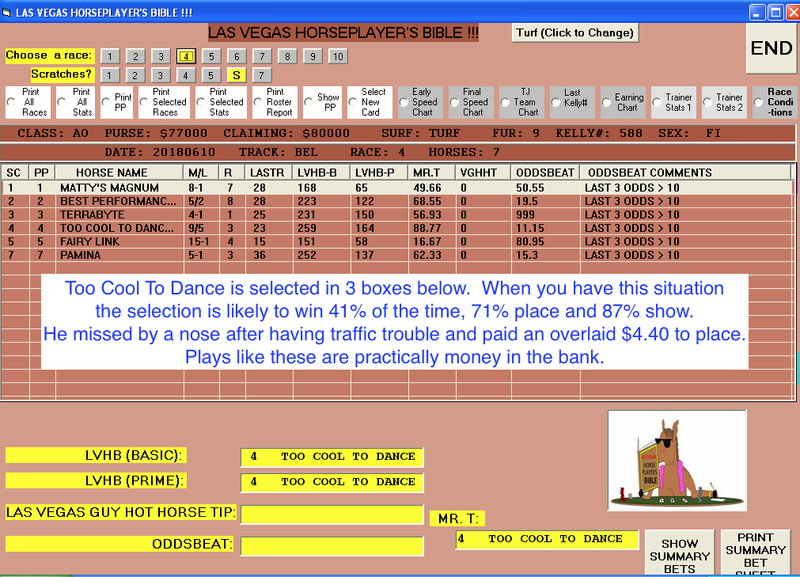 And, in fact, it was partially programmed as a side feature on our Racetrack Millionaire & SuperChalk software. But NOW, for the first time ever, LVHB has been programmed in its entirety, with several other incredible NEW features added! Imagine walking into any casino racebook or satellite wagering facility, anywhere in the country, confidently armed with KNOWLEDGE that will allow you to several tracks successfully at the same time. Knowledge that gives you a decided edge over the rest of the betting crowd, most of whom are, and always will be, confirmed losers. And then imagine that obtaining this knowledge requires absolutely no work on your part; just your desire to win, and to implement an element of the game that is widely ignored by the masses – and the implementation is done entirely by the software! Sound good? a sensational, state-of-the-art program designed to provide players at any level of the game many, many happy returns! So the dirt-simple methodology that he came up with worked very well, yielding him a decent profit by playing up to five tracks. But he knew he could do even better. He then expanded upon this concept, making the method even tighter — a bit less action but more profit. >>>Then, over the next several months, he added other spot-play methodologies, and the end result was something any player would find a glory to behold! And within a year, he was earning most of his income at the racebook by utilizing his discoveries — >>>discoveries that many have called absolutely ‘brilliant’. 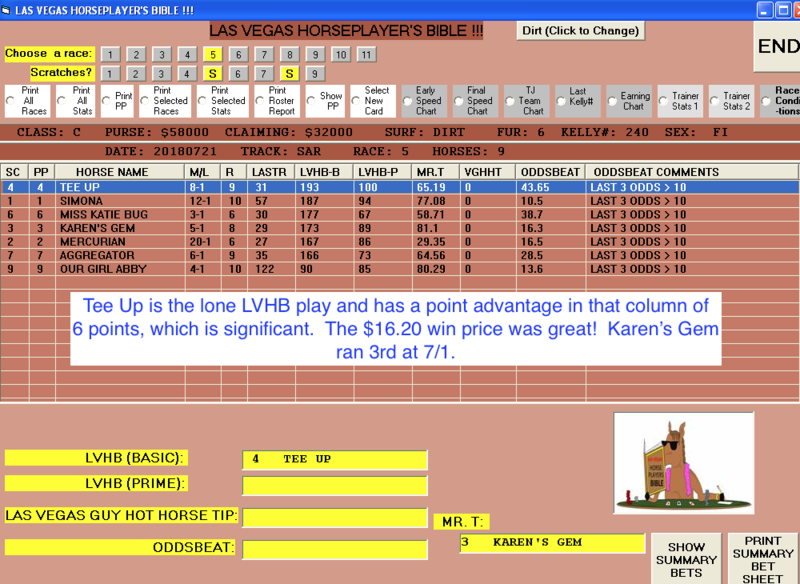 Horse selected by LVHB-B & LVHB-P = 36.3% win rate (bet at m/l odds of 3/1 or higher — +23% ROI! 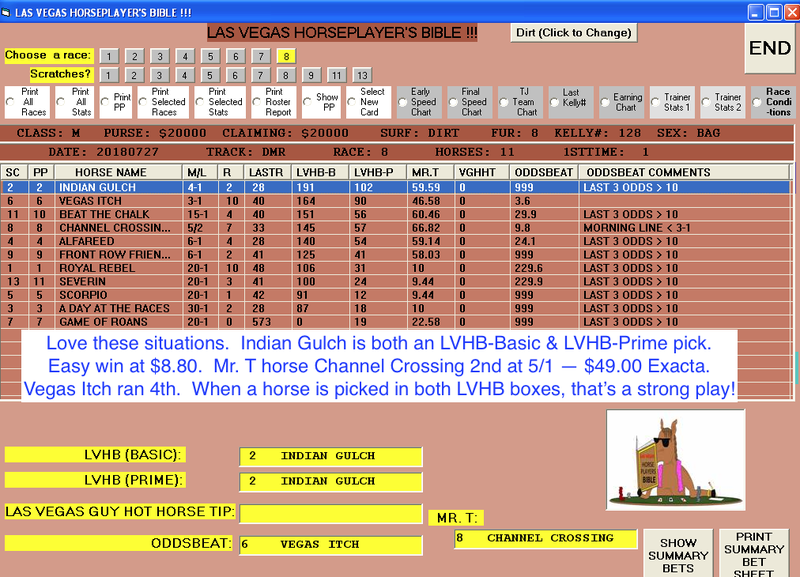 Horse selected by VGHHT (Las Vegas Guy Hot Horse Tip) = is best utilized to place and show — place rate @55%; show rate @78%. These horses should always be used in your Exotics and because these horses are seldom favorites, you get some nice place and show prices. 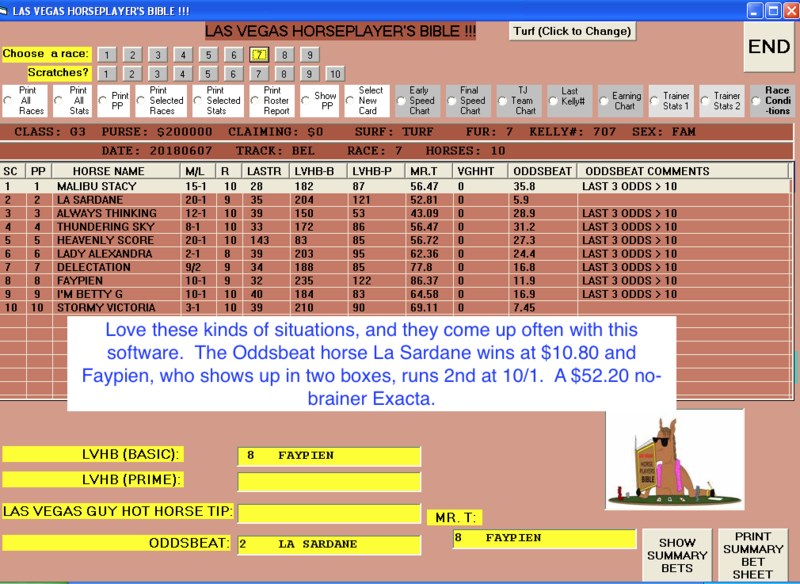 Horse selected by ODDSBEAT = a unique formula that uses past odds to predict future performance. Horses often at a nice price. 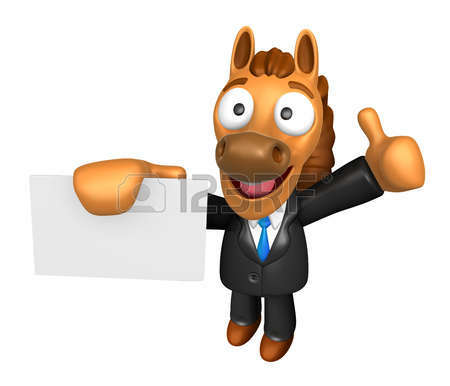 Bet Oddsbeat horses at 7/2+ = +21% Win ROI. 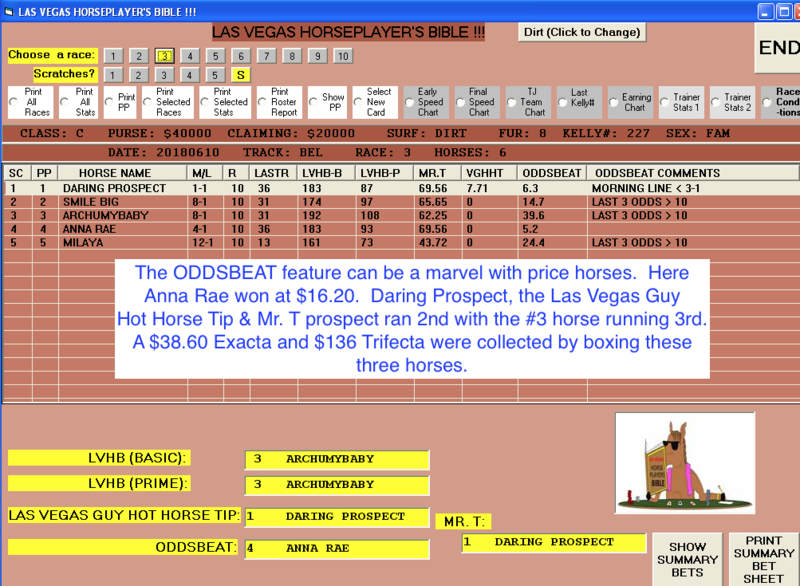 Oddsbeat horses often run 2nd and 3rd as well, so always use in your exotics. We call this the LVHB ‘Basic’ Method, since it is extremely simple and puts you on the major contenders most of the time. This method may appear a bit ‘bare-bones’, but you’ll be delighted at how often you’ve got the winner among your top three totals using this strategy. I use this method myself when I’m in a hurry or just playing casually. 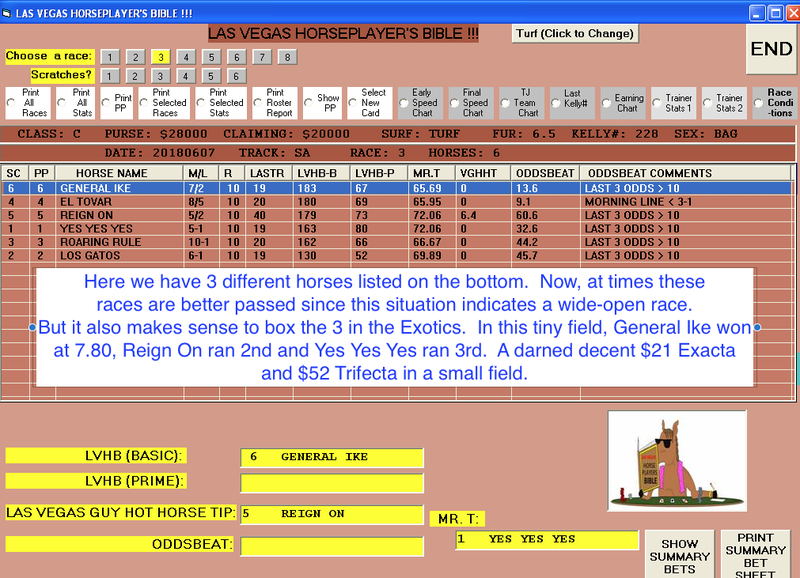 The method combines Adjusted Speed, Connections, Horse win/place %, etc., into a unique formula spells C-O-N-S-I-S-T-E-N-C-Y. 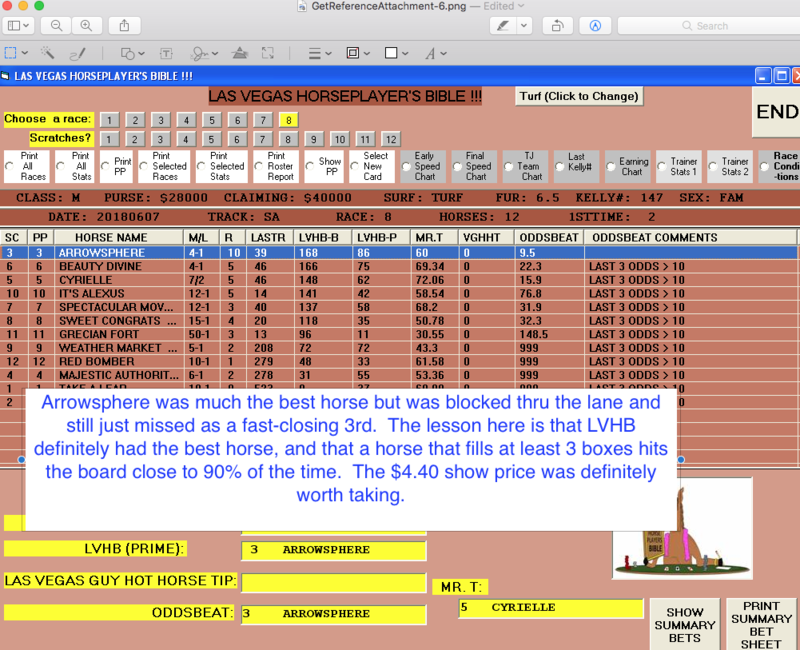 The LVHB PRIME Method has all of the elements of the LVHB-Basic, but adds in a Powerful Jockey/Trainer Team element. LVHP-P tends to produce a slightly lower win % but overall better prices and a better ROI. 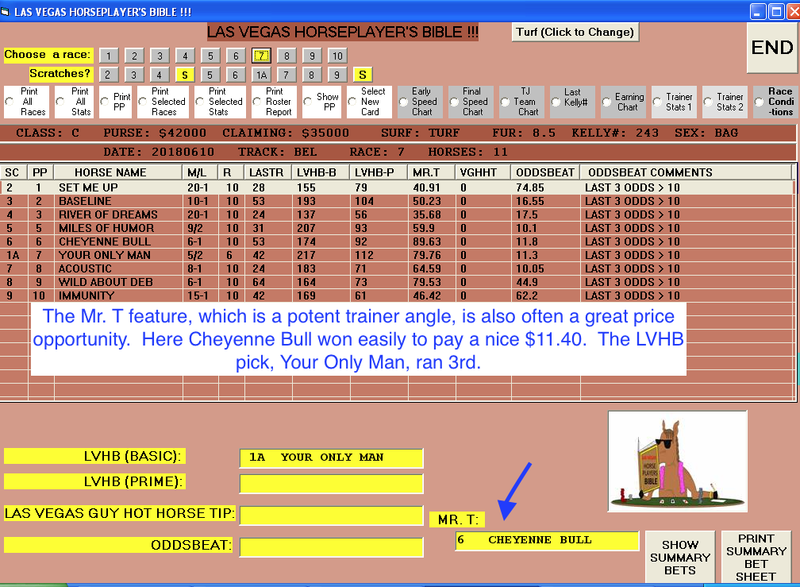 Often you will see the same horse picked by both B & P, which is a very strong win and In-the-Money Play. ‘T’ stands for Trainer, and you are really going to enjoy this feature. We have worked out a unique formula to gauge trainer intention based on overall win & itm %s as well as a few other factors. As you will see from the examples below, the Mr. T feature often produces some great prices. Enter Myron ‘The Cigar’ Weinstein, a true-to-life ‘character’ that you would expect to see in Vegas-themed movies. We met Myron years ago at the old Stardust racebook and became fast friends. While he looks anything but, he turned out to be a real sweetheart. One day, out of the blue, he provided us with a great spot-play angle that has an amazing in-the-money hit rate and the prices are often solid. 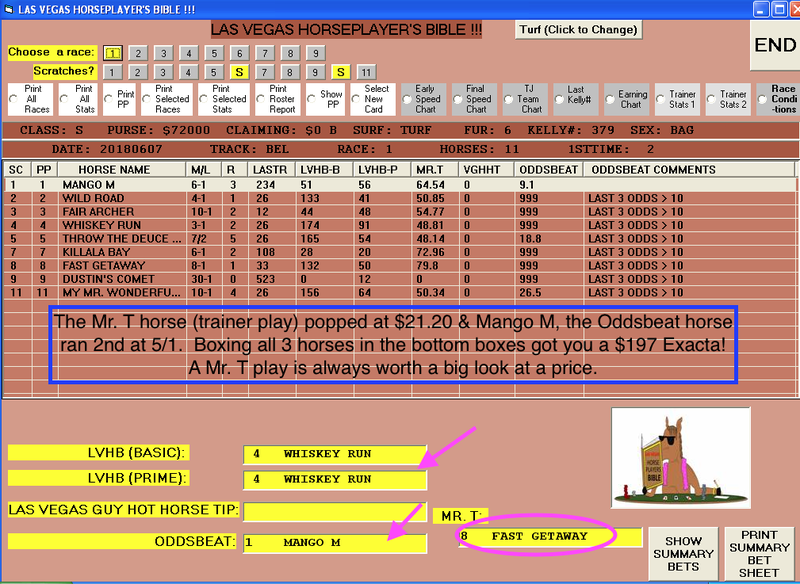 In fact, this could be one of the greatest methods we have ever tested to use for place and show parlay play. ☛Want to know a secret? Certain past odds patterns can identify future winners, often at a price. ☛And we have landed on an absolutely fantastic pattern that produces consistency, great prices and a flat-bet win ROI of +21%! We’re thinking we should have made this a program to sell all on its own — but here it is, included with the LVHB Package, just for you! >>>The bottom line is that you have FIVE POWERFUL ANGLES working for you. Now, don’t let that overwhelm you. Often a single horse is picked by two or more of the angles, so it’s not like you are going to have five separate horses to look at. And, we provide you, IN DETAIL, how to play every conceivable situation. In fact, in the examples below, you will see how various situations are played, but we show you EXACTLY how to get your best return on investment playing just a single Angle, or combining several to greatly enhance your chances of hitting big Exotic payoffs. ODDSBEAT + LVHB + MR.T! 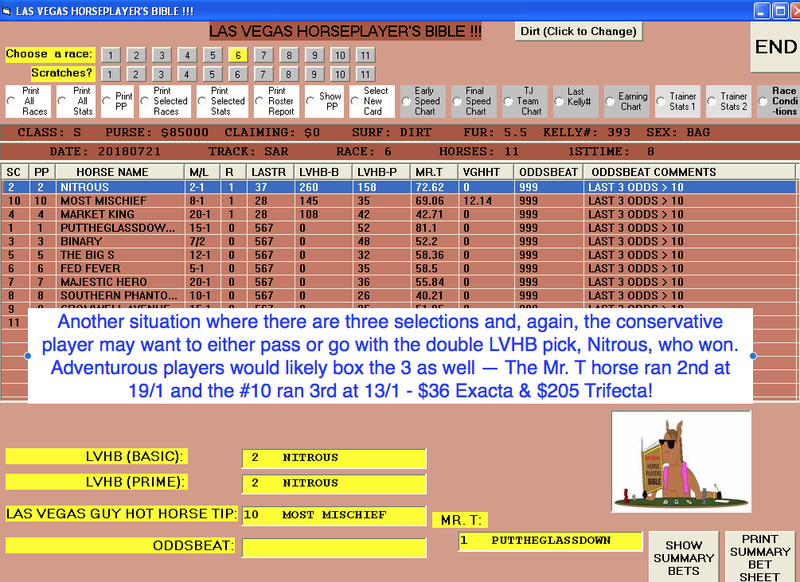 Double LVHB Horse + Exacta! “I’ve been waiting for this one. This was my all time favorite method ever when you had it in just book form. 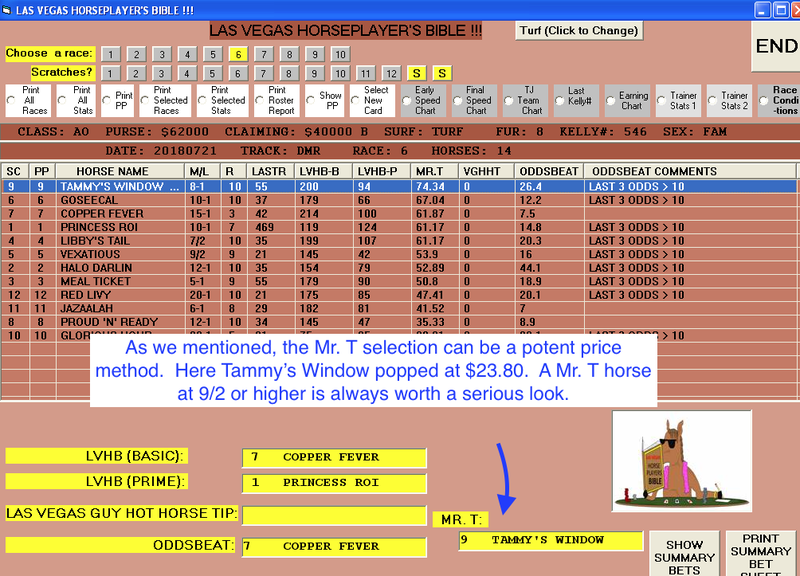 And now with these new features (love the Las Vegas Guy Hot Tip Horse!) you have once again outdone yourselves. It is beyond me that some players are still paying $1,000+ for software that does not come close to holding a candle to yours. Another great job guys.” Donald Salinas, Grand Prairie, TX. 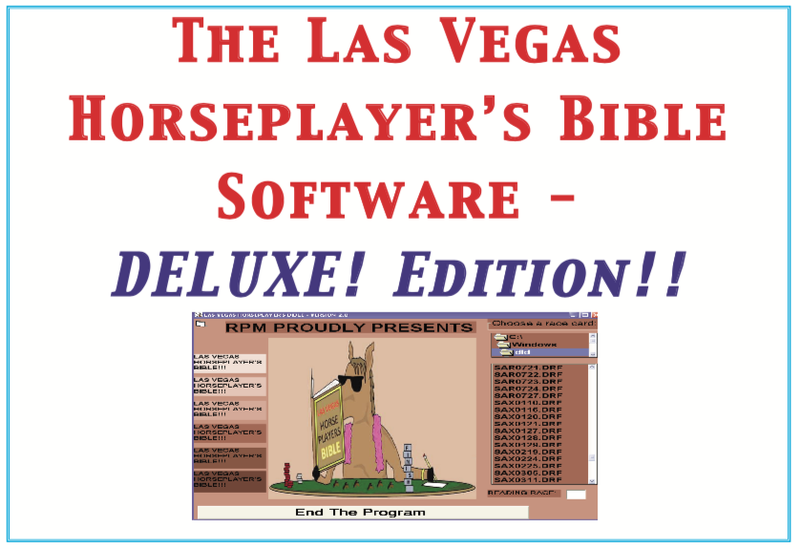 So, Now it’s Up to You, and we are going to be very gentle and offer you The Las Vegas Horseplayers’ Bible Software Deluxe Edition for just $148. But…. at some time, within the next 21 days, we will be increasing the price to $197, so don’t dawdle – make a decision soon. And, of course, all of our software products carry a full Money-Back Guarantee.